We took a trip to Haiti this summer, find and I’d like to share with you how wonderful I felt this time. The trip was very difficult, but very successful as well. Five members of BIF went to La Tortue. Difficulties started immediately at SFO when our first flight was delayed 2 ½ hours, so we missed our flight from Miami to Port-au-Prince. Then, when we arrived in Port-au-Prince, my luggage was not there! It didn’t arrive for another 3 days. We rented a car for a bumpy drive to Port-de-Paix. It was a difficult and hot two day voyage to La Tortue, but we were determined and overcame all obstacles. Carl, Jon, Johnny, and I were focused, with success on our minds. I also thank God for carrying us through and giving us the strength to accomplish the projects that we set out to do in La Tortue. With the help of Jon and Carl, we killed two birds with one stone. Carl, Jon, and Stephanie really got a chance to see the problems the community faces in La Tortue, and were motivated to help. I regretted the fact that Carl did not have time to explore and see the beauty of La Tortue. Carl and I had a working partnership that took us back and forth from La Tortue to Port-de-Paix, and the experience was priceless. As I said, we killed two birds with one stone. 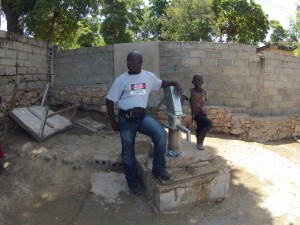 We went to Haiti with one project in mind: to put a pump on the open well in Ti Jonas. We did clean and modernized that well, but community input directed us to put the pump on the well in the marketplace. Community participation and input was enormous, but because of lack of knowledge, the project planning was difficult for some to swallow. I found the trip to be very productive. In a very short time, we did a lot of work, because we were very focused on what we set out to do. It was a very hard trip for me, but also a pleasure at the same time. There was a lot of pressure and responsibility, but it paid off. Carl, Jon, and Stephanie had quite an experience in La Tortue, and travelled up and down the steep hills to Ti Jonas. We also had Chilet with us, an agronomist from Trees for the Future. He will be emailing us a reforestation assessment of La Tortue based on his experience there. But what was most important to me on this trip was that, despite all the difficulties, we finished the projects on time. I am so grateful for that, and proud of Carl, Jon, Stephanie, and myself. I am especially grateful to my partner, Denise, who has always been with me from the beginning. 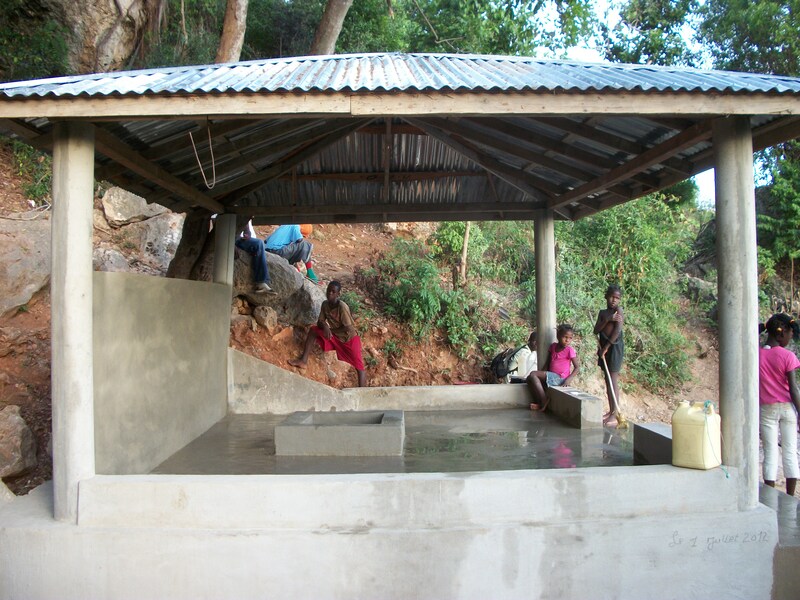 Ti Jonas well, after renovation. On this trip, I really began to see Haiti moving forward in many ways. After the devastation of the earthquake in 2010, so many terrible things were happening. Women and girls were being raped right in front of their families. Now, it seems like people are starting to have a little more confidence. I believe when people begin to feel good about themselves, they begin to feel more confident, and that’s when you see changes beginning to happen. I believe the work we are doing in Haiti will pay off in the near future, and I believe I will see some of that change in my lifetime. I’m so thankful to all those who have supported our work these last six years. Without that support, it just wouldn’t be possible. All of the thanks go to you. We would like to continue to share with you the work that we are doing on the island of La Tortue, and invite you to continue helping us with this wonderful movement so the people there can secure their futures. After many meetings with community leaders, we came to see that water and sanitation are the priorities for the island of La Tortue, and this guided our work on the two projects that we completed. We installed a pump on the marketplace well, and improved the sanitation of the Ti Jonas well. Because of the earthquake, then the cholera outbreak, and on challenge after another, we need your help now more than ever. I need your support on future trips, so we can complete more projects that have a direct impact on the living conditions in La Tortue!